What Instrument Should I Play? How hard could it be to buy a simple bathroom accessory like a shower curtain? Given the sheer number of choices available, quite hard, it turns out. Buying a shower curtain is not just about finding a color that matches the tiles. A good shower curtain prevents the bathroom from getting flooded and doesn’t require constant care to keep the mold off. No one really gives this much thought to buying a mere shower curtain. But you really should. This product caught our eyes with its stunning design. The curtain is sheer clear in color, but the image is distorted thanks to mirror-like cubes. It’s made from a material that is both odor and mildew resistant. The shower curtain isn’t made from regular plastic, but a new substance called EVA that is environmentally-friendly and repels bad bacteria and mold. The metal grommets that hang up the shower curtain are rust resistant. Thanks to that, there isn’t much care needed. The shower curtain is standard sized at 72 x 72 inches so it should fit any bathroom. What we didn’t like was the lack of opaqueness. The white material is clear enough to give a general shape of a person in the shower. However, it doesn’t show anything and protects privacy well. The shower curtain is thick and heavy. This shower curtain is superbly affordable. It costs less than ten bucks. This is not a luxury brand for bathroom products. But the Aimjerry shower curtain is so elegant it can make your eyes water. Imagine a shower curtain with high-end designs and a touch of classic Greek art. That is this shower curtain. It’s white with dark lines, so it should suit just about any standard bathroom and shower. As always, the design isn’t everything. 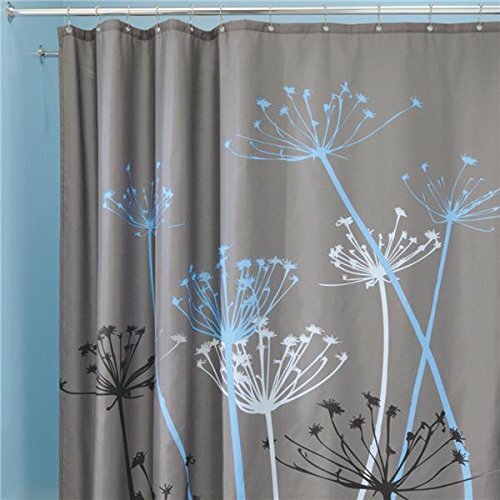 Not only is this shower curtain stylish, it has reinforced holes for the metal hooks. The header is reinforced double. Both the hem and the grommets are rust resistant. The hem is weighted to keep it in place. Performance-wise, this shower curtain is water-resistant, not waterproof. It has to be placed very carefully to avoid spillover. This shower curtain doesn’t prevent spillage all the time. Even with the weighted hem, some spilled out eventually. It’s made from polyester material. Polyester can repel droplets of water but is not completely waterproof. This shower curtain requires maintenance to keep stains and mildew off. For what it’s worth, the curtain is machine washable. If shower curtains were branded like furniture, then InterDesign would be one of the best shower curtains brand out there. The label is known for offering very stylish and highly functional shower curtains. And Thistle is really no different. This shower curtain is immediately eye-catching. It has a gorgeous design of giant, colorful dandelions against a silvery-gray background. The curtain is like a work of art. The most prominent colors are gray and blue, which can reinvigorate the looks of even the most boring bathroom. The shower curtain is standard sized and is made from 100% polyester. It has two grommets, all rustproof and a reinforced top header. The curtain is really easy to hang. The material is resistant to both mold and mildew. We didn’t have to worry about soap scum because the sides and the bottom are bluntly cut. The curtain, therefore, won’t collect soap scum. The curtain is very hygienic and requires almost no maintenance. But if you want to, you can wash it in a machine and tumble dry. The curtain retains color and doesn’t lose shape after tumble drying low. As for downsides, the lack of weight at the bottom of the hem can make the curtain move. There’s also the obvious problem of color matching if your bathroom already follows a certain theme. This shower curtain is simply dazzling. Made from 100% polyester, it embodies a truly unique design. The shower curtain is metallic silver in color. 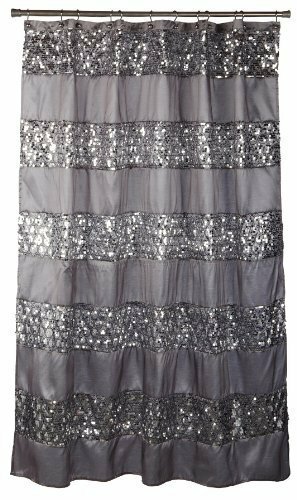 In addition, it has bands of silver sequins decoratively attached to it. The superbly chic look makes bathrooms look luxurious and interesting. If you want to go all the way, there are matching soap dispensers, towels, a rug and a wastebasket with the same pattern. The only disappointment is the size of the curtain. It’s 70 x 72 inches in size, which means it’s slightly less tall than most shower curtains. This shower curtains can be machine washed, despite the sequins. But it’s instructed to use the gentle cycle and not to bleach or tumble-dry. 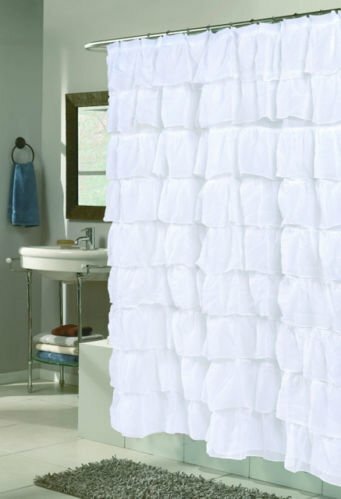 It can be used with a shower curtain liner. Overall, this shower curtain is good at preventing water from spilling all over the bathroom floor. We had to take care when hanging up the curtain. Don’t cut anything because the sequins might fall off. Hair can get caught between the sequins. This is another incredible chic design for a shower curtain. As the name suggests, this shower curtain isn’t a single thin sheet. In fact, it has bouffant layers like a well-tailored dress. The white ruffles look gorgeous and make the bathroom look stylish and cozy. The ruffles and the sheet is made from 100% polyester. It’s water-resistant, but not entirely waterproof. As stunning as this is, it is only 70 x 72 inches in size. So the shower curtain doesn’t really reach the very bottom in a standard-size bathroom. That may cause pooling of water on the bathroom floor because of the shower curtain. But you can adjust the header to prevent this. The ruffled curtain can be machine-washed. But avoid tumble-drying to protect the ruffles. Be careful when cleaning because the ruffles can wrinkle. They can’t be ironed out. The white curtain is a bit sheer. The ruffles don’t hide everything. Some users may want to add a liner underneath. Otherwise, this is a great product to add a girly and classy touch to your bathroom. 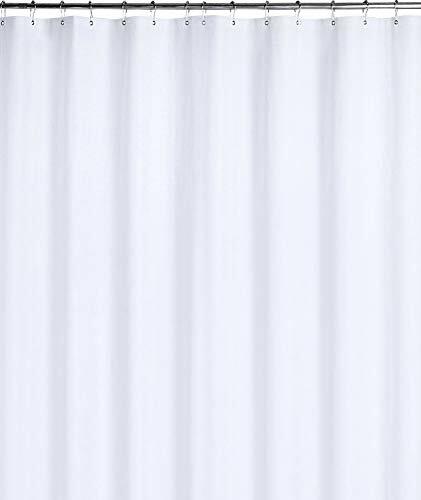 Lorraine Home Fashions 08383-SC-00001 Gypsy Shower Curtain, White, 70" x 72"
Think all shower curtains are made the same? Think again. Synthetic shower curtains are the cheapest you will find anywhere. Made out of a water repellant material, these curtains are also highly durable. You can expect synthetic shower curtains to protect against mildew buildup. These products don’t require much maintenance either. Synthetic shower curtains can be made out of different types of artificial fabrics such as nylon, polyester, or nylon-cotton blends. Polyester is the most common material for shower curtains. Why? Mainly because polyester isn’t flammable. The fabric dries quickly and doesn’t cost much. Polyester shower curtains do not crease or wrinkle either (unless you put them in the tumble dry in some cases). Natural fabrics are material like linen or cotton. Natural fabric shower curtains are more expensive. Of course, natural fabrics like cotton are not waterproof. So these shower curtains are often treated with a waterproofing agent. Therefore, the effectiveness of the shower curtain can deteriorate with age. You may also need to use a liner with these shower curtains because cotton and linen are not water-resistant at all. Natural fabrics are also more flammable. Therefore, it’s recommended not to use this type of shower curtain unless you absolutely want to. The bottom line is, synthetic shower curtains are cheaper and safer. Unless you have an allergy, it’s not necessary to choose natural fiber shower curtains. You must always consider the width and the height of a shower curtain before buying. This will depend on your shower or bathtub. To find the right width for your bathroom, measure the curtain rod and add in an extra 12 inches. To determine the height, measure down from the curtain rod to the tub. If you have a built-in tub, measure from the rod to the top of the tub and add one or two more inches. If you have a claw foot bathtub, you will need plenty of extra inches. The curtain must go inside the claw foot tub to prevent leakage. So make sure the curtain is tall enough to go inside. If you want a shower curtain for a showering area without a stall, take your measurements carefully. Without a stall partition, the curtain may not necessarily prevent all water leakage. Shower curtains don’t need much maintenance. However, these can gather soap scum and dirt and will require occasional washing. Buy a machine washable shower curtain to make the process easy. Nearly all synthetic polyester shower curtains are machine washable. Some curtains can even be tumble dried. But it’s best to hang-dry to maintain shape and color. This is determined by the material. If you buy a synthetic shower curtain, it will be water-resistant to a great degree. Not all shower curtains are completely waterproof, however. You can increase the water resistance of a shower curtain by using a curtain liner. Buy a synthetic shower curtain to prevent the buildup of mold and mildew in the bathroom. When buying, look specifically for curtains that offer resistance against mold and mildew. You might want to consider the exact color of the shower curtain to make sure it matches the existing décor of the bathroom. However, this is really up to you to decide. If you are not sure which color to choose, go with a plain, white shade. This matches nearly all bathrooms. If you buy an expensive shower curtain, then consider buying a liner for it. The liner will protect the curtain and minimize the need to wash it constantly. Some shower curtains have pockets. You can keep toiletries inside for convenience and to increase storage space in your bathroom overall. Before buying, read customer reviews to find out how sheer the shower curtain is. Some curtains can be quite sheer even if the product pictures don’t really show it. Buying a shower curtain isn’t rocket science. However, paying attention to simple features like size, material, and mold resistance will ensure that you end up with a great product. A shower curtain adds style to your bathroom, in addition to functionality. 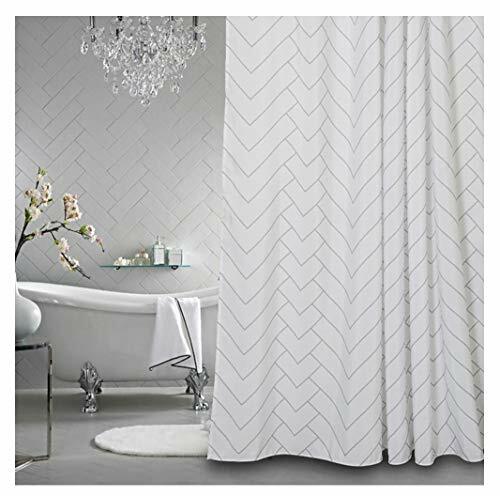 Therefore, refer to the best products reviewed above to buy a shower curtain that will complement your bathroom the best. Copyright ©2019, ConsumerHelp Guide. All rights reserved. Affiliate links / Images from Amazon Product Advertising API. ConsumerHelp Guide is a participant in the Amazon Services LLC Associates Program, an affiliate advertising program designed to provide a means for website owners to earn advertising fees by advertising and linking to amazon(.com, .co.uk, .ca etc) and any other website that may be affiliated with Amazon Service LLC Associates Program.